The Briton has reappeared in Sepang after his serious injury in October where he broke the tibial pylon, the fibia and the talus bone of his right ankle. Cal Crutchlow lost control of his Honda at Turn 1, at more than 200 kilometers per hour, in the second free practice of the GP of Australia on October 26. The next day the lesions were reduced and the following week he was fixed with plates and screws on the 'destrozo 'that had been done on the right ankle when the tibial pylon, the tibia and the talus bone were broken to total 17 fractures. The British LCR Honda has reappeared just three months later after thinking that his career was over. 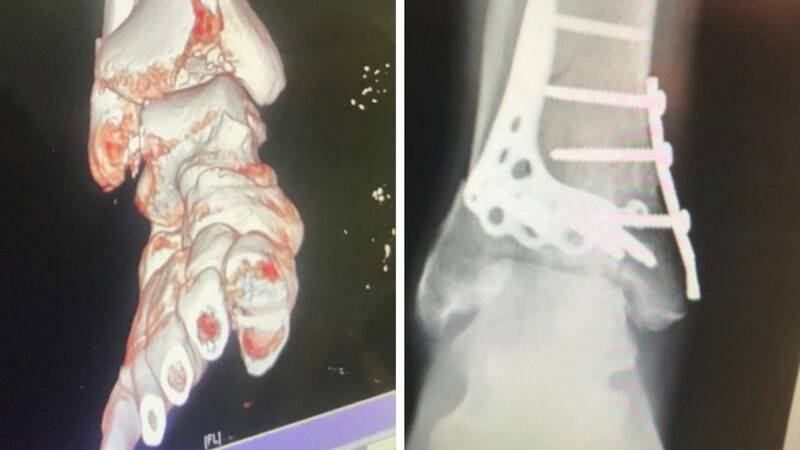 "From the beginning I knew it was a very serious injury, my surgeon told me later that they were very close to having to fuse my ankle because of how bad the fracture was. It's known as pylon fracture, and basically it's the worst thing that it can happen to you, "Crutchlow explained to 'motorcyclenews.com'. , and he continued to tell how the German surgeon Matthias Russ worked the miracle ... that it is still hurting and that he needed many more months until the joint regains 100% His mobility: "They had to rebuild the talus and that was what worried me the most." I have two plates on my tibia, one inside and one in the center, but they did not put it on my fibula, and that seems to me. it causes the pain that I am suffering now. The problem is that they did not have place to put a plate there ". Crutchlow is already on his motorcycle and with his eyes set on the Qatar GP on March 10, but he recognizes that he has had a bad time taking into account that his injury usually has a normal recovery close to one year: "It has been three very difficult months. I have had great injuries before, but not from this level. I know people from the motorcycle world who have had to retire because of this injury. There were moments when, being honest, I thought I could never ride again. But I always had the desire to continue training, to continue going to the physiotherapist. My mental state was still competitive and I want to continue in MotoGP. I never threw in the towel. " Because Crutchlow's words are not enough to understand the injury the journalist Max Oxley has shown on 'Twitter' how his ankle was before the operation and how he has been after the surgery with X-rays that has sent Crutchlow himself and in which they estimate that in his obillo carries a kilo of steel, the amount that has been necessary to 'fix' the 17 fractures.